While Elon Musk was at a big industry conference trying to convince utilities that Tesla is their ally, a former competitor took to the airwaves to convince investors that Tesla is overvalued. 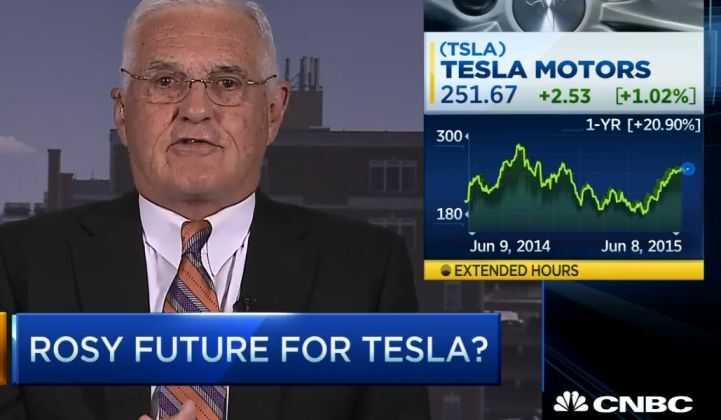 Bob Lutz, the former vice chairman of General Motors, appeared on CNBC's Squawk Box earlier this week to talk about Tesla's new plan to sell stationary batteries for homes, businesses and large grid applications. According to Lutz, if the stationary storage market were truly ready for growth, it would have been tapped by Alessandro Volta in 1800 when he invented the first battery. "I don’t think it’s a charade. But I think it’s greatly overvalued because having batteries as backup storage, that’s been around for hundreds of years," he said. "I can't understand the fascination with this." Things have changed a bit over the last couple hundred of years, however. Lithium-ion battery costs are falling by 14 percent a year, making them the most competitive choice for a variety of short-duration applications. And a surge in distributed energy is also causing grid-balancing needs to evolve quickly. Lutz isn't convinced. In spite of real-world experience and numerous projections for continued battery cost declines, he expressed skepticism over Tesla's ability to make lithium-ion more competitive by building its Gigafactory. "When you look at lithium-ion batteries, the process of making lithium-ion batteries is almost totally automated. Whether you’ve got a factory in China or a factory in the United States, it’s all fully automated equipment behind glass. And whether you have two assembly lines for the batteries, or 15 assembly lines, it doesn’t matter," said Lutz. "The highest cost in the lithium-ion battery is not the assembly labor; it’s the raw materials. And the raw materials have to be procured at a certain price. And everybody pays more or less the same price. If Elon for his next act says, ‘I bought up every country that produces lithium and therefore I now control the global supply of lithium,’ then I would say, 'Yeah, there’s a chance he’s going to gain a competitive advantage.' Other than that, boy, I don’t see it." But Tesla executives say they can control those costs by cutting out inefficiencies in the supply chain. In a recent interview with Planet Money, Tesla CTO JB Straubel explained how the Gigafactory will shave off shipping costs for materials and batteries: "We're adding up a bunch of single-digit-percent improvements to get to something that's, you know, 30 percent or greater." "The lithium that goes into batteries, it often...starts in South America. [...] It will go to parts of North America to get processed. It may go back to Japan...to get processed into yet another material, built into a battery, shipped to the U.S. to be made into a battery pack. [...] That car might get shipped to Europe. So by the time the car is delivered...the poor lithium atom has gone 30,000 miles. Horribly inefficient," said Straubel. Even if stationary battery costs continue to come down, Lutz said he thinks it's a distraction from Tesla's electric car business. "Every time the question is, 'What about the car business?' he says, 'Never mind the car business; I have an even better idea.' And then he rolls out the battery thing," said Lutz. "I’m just saying that if I were a holder, I would think now is about the top that stock is going to attain." Investors don't agree. Tesla's stock has climbed from $225 to $250 since the Powerwall was announced. And analysts at Baird set a $335 price target for Tesla stock this week.